The links at the bottom of the page and the buttons on the left-hand side of the page lead to a “rogue’s gallery” of large and small buckled shells and shells that can buckle if designed improperly. These give an idea of what a “shell” is and what “buckling” is. 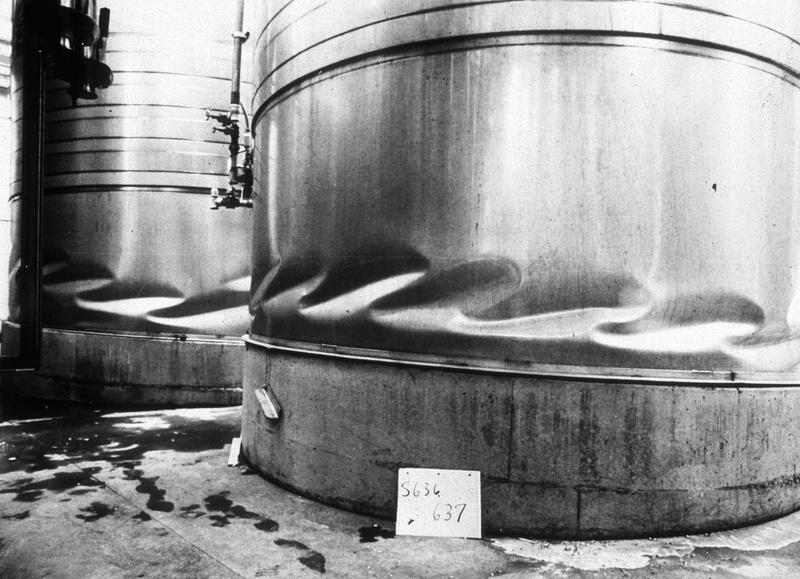 These thin stainless steel wine tanks buckled in an earthquake near Livermore, California at the Wente Brothers winery in 1979. Note that some of the tanks buckled more or less axisymmetrically whereas others buckled non-axisymmetrically. 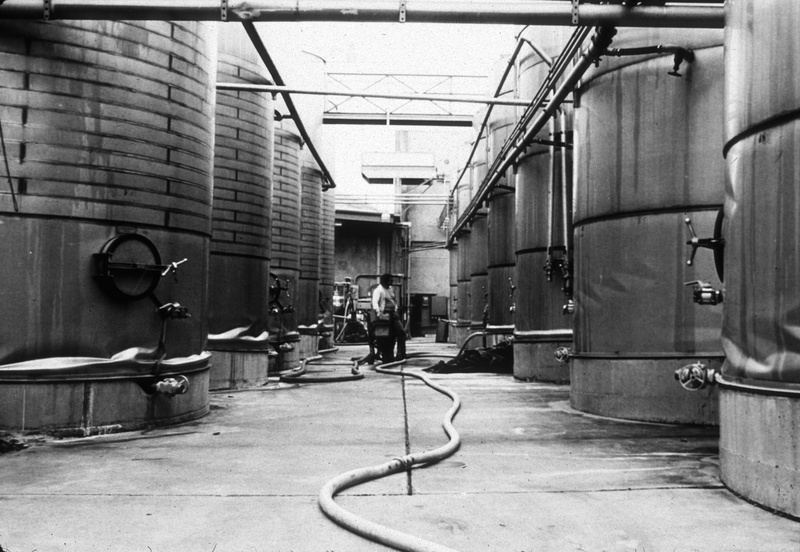 Buckling near the base of the tanks is caused primarily by axial compression caused by a reaction to the overturning moment generated by horizontal ground motion during an earthquake combined with hoop tension from the hydrostatic pressure of the wine in the tank. Therefore, the buckles are elongated in the circumferential direction. They occur primarily near the bottom of the tank because the axial compression is greatest there. More buckled tanks at Wente Brothers. These buckling patterns are caused by a combination of axial compression from the overturning moment generated by an earthquake, axisymmetric hoop tension generated by the hydrostatic internal pressure from the stored wine and in-plane shear generated by earthquake motion. The maximum in-plane shear occurs 90 degrees around the circumference from the maximum axial compression. View more photos of buckled shells. Read the paper, Buckling of shells – pitfall for designers, David Bushnell. AIAA Journal, Vol. 19, No. 9, 1981.